My grandma was Melba Loughlin. She lived to be 88 years old. Mom said that when she was younger, she was flown to Cuba to sing opera. At some point in her fledgling career, she got pneumonia and when she recovered, she had lost the ability to hit the high notes. I think if you do the math, you'll see that without trips to Cuba, she probably settled down, got married and had the baby that would some day be my mom. Sometimes these things work out. 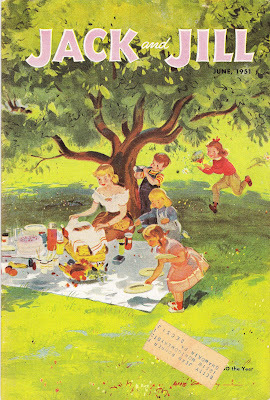 Where this is going is that later on in life, Melba wrote music for Jack and Jill magazine. Thanks to E-bay, I can track down some of my family's past. 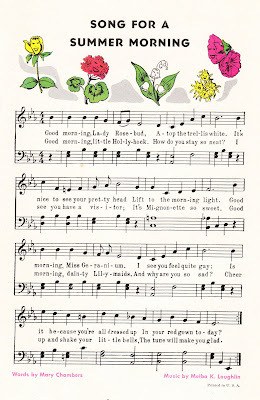 Here's the cover and the music and lyrics from one of her songs entitled, "Song for a Summer Morning." "He's squashing us. He's squashing us." It's screamed and "fussed." Your mother ought to know that. Weird... one of the only details I have for my blogging profile is that I am a grandchild of Melba. Only claim to fame I have.